The Departement of Bouches du Rhone - Pop. 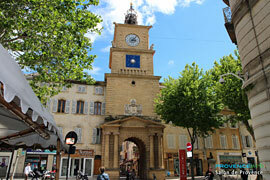 : 43.115 h.
On the N7 and the A8, between Aix en Provence (30km) and Avignon (48km). Strategically situated between the Alpilles, the Camargue and the Aix-Marseille route, Salon de Provence is surrounded by magnificent countryside where the olive tree tree is "king"! 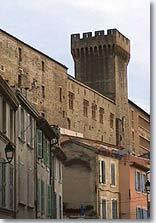 The oldest part of Salon is built on a small foot-hill, over-looking the narrow streets. 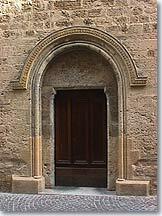 You can visit the "château de l'Empéri" which was the former residence of the archbishops of Arles. 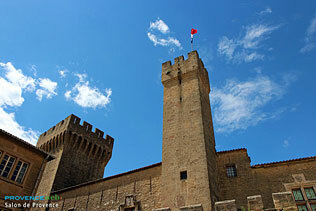 Rebuilt in the 13th century, this medieval fortress is today in perfect condition as it has been restored and maintained with the utmost care. By crossing the picturesque interior courtyard, you can visit the "Musée de l'Emperi" which has more than 30 exhibition rooms displaying garments, uniforms and military regalia from the 17th century to 1918. 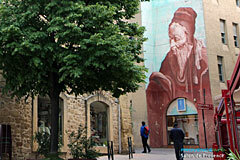 Salon is one of the oldest villages in Provence and it was the village of the famous clairvoyant scholarNostradamus. His house is in the old district and it is now a museum which details his life and unique personality. His birthplace was St Rémy, he died in Salon. 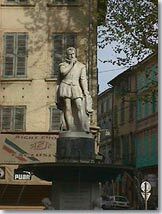 In the 16th century a certain Adam De Craponne invented and built the irrigation system later used throughout the district... thanks to Mr De Craponne and his ingenious system, the countryside soon prospered and today Salon de Provence is one of the most charming in the area. 18th century porte de l'horloge. 17th century town hall. 13th century St Michel church. 18th century Collégiale St Laurent. The house of Nostradamus. Grévin museum of Provence. L'école des bergers - School of the shepherds (domaine du Merle). Hiking, mountain bike hire, horse-riding. Tennis, swimming pool, 18-hole golf course. you can admire superb acrobatics. Pélissanne (5km), Grans (6km), Miramas (12km).